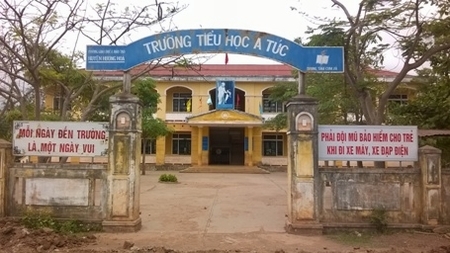 HA NOI (VNS) — The Deputy Minister of Education and Training, Nguyen Vinh Hien, has requested the Department of Education and Training in central Quang Tri Province and educational authorities nationwide to strengthen evaluations of the academic performance of students. Students found to have weak learning capacity must get support to handle the knowledge designed for their grades, he said. The request was made after the local media reported that a group of students in A Tuc Primary School and A Doi Primary and Secondary Schools in central Quang Tri could not read or write after years of study. The students with little learning ability or knowledge were said to be "sitting in the wrong class", which meant they should be in a lower grade. The ministry sent a team to investigate the claims. After working with schools, teachers and parents, the ministry admitted that the incident had been correctly reported. Three students of A Tuc Primary School - two in five graders and one in grade four - could not read and could only write simple words. They were certified as having disabilities by the Huong Hoa District Hospital because two of the children were mentally challenged and one was deaf. The fourth student was verified as being regularly absent from school, but still moving up in the grade system. At A Doi primary and secondary schools, three seventh graders could not read fluently and were declared not to have sufficient academic standards to comprehend lessons. Deputy Minister Hien said the incident was caused by irresponsible head teachers who incorrectly reported the learning capacity of students and did not take measures to support those who were in need of assistance. He said loose management of the school managing boards contributed to the problem. He cited A Tuc Primary School as an example. The school did not have curriculum for disabled students. The provincial Department of Education and Training and the district's sub-department of Education and Training were also responsible, he said.